Corporations generally build up relationships with other corporations, whether good or bad. A corporation will generally have one or more Diplomats whose job is to deal eith third parties on behalf of the corporation and to come to diplomatic agreements. Generally diplomatic agreements involve corporations (or alliances) setting "standings" towards one another. Standings can be set either on a personal level (so only you can see them), a corporation level or at an alliance level. Standing can be set for individual players, for corporations and for alliances. NRDS - Not red, don't shoot: This means that members can only aggress other players who have 'red' standing (i.e. -5 or -10). NBSI - Not blue, shoot it: This means that members can aggress any other players aside from those who has 'blue' standing (i.e. +5 or +10). To set corporation or alliance standings towards a player, corporation or alliance, either right click their name in chat or a mail, and choose Add Corporation Contact or Add Alliance Contact. You can also open their information sheet, click the four bars the the top left and choose the same options. You will then get a pop up window which enables you to set the standings, either by selecting one of the statuses set out in the table above, or by using the sliding scale to select values in between. 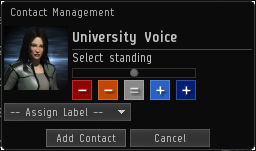 You can also add a label, which may be useful in informing your corporation members why a particular standing has been set. Once you have set standings, you can edit or remove them by right clicking their name in chat or a mail, and choose Edit Corporation Contact or Remove Corporation Contact. You can also open their information sheet, click the four bars the the top left and choose the same options. Note: Standings are one-way only. The player, corporation or alliance will not see what standings you have set for them, and will not automatically set your corporation at the same standings. If you have come to an agreement with another corporation or alliance it is important to ensure that they have also set the appropriate standings towards your corporation or alliance, to avoid any misunderstandings later on. War is a game mechanic which allows corporations and/or alliances to fight in high or low security space without CONCORD intervention or security status loss. To initiate a war, a corporation/alliance must pay a fee to CONCORD. To declare war on another corporation/alliance you must have the director or CEO role in your current corporation. Note that NPC corporations cannot initiate or receive a war declaration, and nor can corporations which do not own at least one anchored structure. The CEO or a director of the corporation (which must be the executor corporation if the corporation is part of an alliance) must go to the Corporation window, Alliances tab (if the corporation is part of an alliance), then the Home tab. At the bottom of the window is button labelled Declare War. The CEO must push the button and enter the name of the target corporation or alliance, then press search. Once he or she has confirmed the selected alliance is the correct one, war is immediately declared with no confirmation of the fee. Once war is declared, there is a 24 hour startup period in which fighting cannot occur, to give both sides a chance to get ready for the war. Once the war is active, there will be a period of one week where any aggression can occur between the two sides without CONCORD intervention. 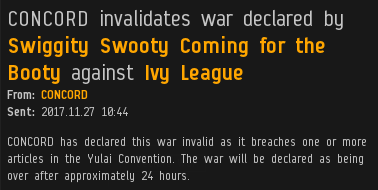 It costs a static fee of 50 million ISK to issue a war declaration. If the receiver of the war declaration chooses, they can make the war mutual. Mutual wars do not cost the aggressor the usual weekly fee and won't expire unless the war is manually retracted or the mutual status is revoked. Any allies in a war that has been made mutual will be dropped from the war and no side in a mutual war is able to accept or receive allies. War can be surrendered by the either corporation's CEO or a Director. The other side is given the option to accept or decline it. The surrender option can involve a payment of ISK in return for acceptance. It also means these entities cannot declare war on each other for the following two weeks. In the case where a defender has made the war mutual, the original aggressor can retract the war and it will end after the 24 hour cool down. However a war ends, there will be a 24 hour cooldown period where fighting can still occur. This prevents ending a war to avoid a particular engagement. After this cooldown, normal CONCORD services will resume. Go to Corporation window, select the Wars tab and then the Our Wars tab. This tells you when the war started. You can also use the "Show Info" on any given corporation or alliance and go to the War tab and you can see the history of finished wars, current wars, and pending wars. Third parties are able to join in a war as an 'ally', which allows them to fight in the war also with the same lack of CONCORD intervention. Allies can only join on the side of the defender, not the attacker. You can have an unlimited number of allies, though the allies are for that individual war. If you want them to help in other wars also they will need to become allies for the other wars as well. Allies cannot join a war if they are already at war with the attacker. Requests to become allies can be submitted at any time, but if you are a defender a director or CEO can flag your corporation as specifically being open for ally requests. To do this, go to Corporation window, select the Wars tab and then the Our Wars tab, find the particular war you want to open for allies and click the four bars to the right. There will be an option to Open for Allies. What this does is puts a flag by your corporation in the list of wars in the All Wars tab, which looks like: Corporations who are interested in becoming allies can filter the All Wars tab by those who have Assistance requests only. Only the CEO of Director of a corporation can make an ally offer. To offer to become an ally in someone else's war, select the four bars next to the war details and select Offer Assistance. You will be presented with a pop-up window which will allow you to include a message to the defender and also specify an amount of ISK you would like them to pay your corporation for your assistance. It is not necessary to enter an ISK value or message. When a corporation offers to ally with yours, you will receive a notification informing you of the ally request. You can view the request under Corporation window, select the Wars tab and then the Our Wars tab. There will be a new icon next to the war details: . If you select the ally request you will have the option to Accept of Reject the offer. If an ISK value is agreed, this will be taken from the Master Wallet. It is a one-off payment, and will not reoccur if the war continues for more than the first week. If an ally request is accepted, there is again a 24 hour period for them to prepare before they can start fighting. After 24 hours they will be able to fight the attackers (but not the defenders). You can view a report of any particular war either by going to Corporation window, select the Wars tab and then the Our Wars tab, clicking the four bars next to the war and selecting Open War Report, or looking up the details of the corporation, going to the War History tab, clicking the four bars next to the war and selecting Open War Report. The War Report is visible to anybody. 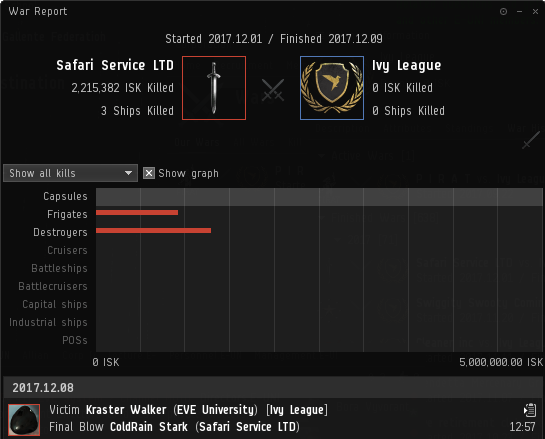 The war report contains information about the number of ships killed for each side and the ISK value of those ships. It also contains links to the lossmails for every ship, which you can filter by the attacker and the defender. You can also view information on the types of ships lost in a graph. This page was last modified on 12 April 2019, at 15:17. This page has been accessed 15,651 times.